The Cayuga-Seneca Canal is the shortest of all the canals that make up the New York State Canal System. Beginning at its junction with the Erie Canal at Kipp Island (the Cayuga-Seneca/Erie Canal Junction), located 1.6 SM (1.4 NM) east of Erie Canal Lock E25, the Cayuga-Seneca Canal then runs south to the Cayuga Lake/Seneca Lake Junction then south to Ithaca, NY or you can turn west to Seneca Lake and then south to Watkins Glen, NY. The navigation season for the Cayuga-Seneca Canal is, for the most part, different than the rest of the New York State Canal System having typically longer operating hours. From early May through September, lock operating hours are typically from 0700 to 2200 daily. However, shortly after Labor Day until the navigation season closes, these hours are typically restricted to 0700 to 1700 daily. The current season’’s operating schedule can be found in the right sidebar. 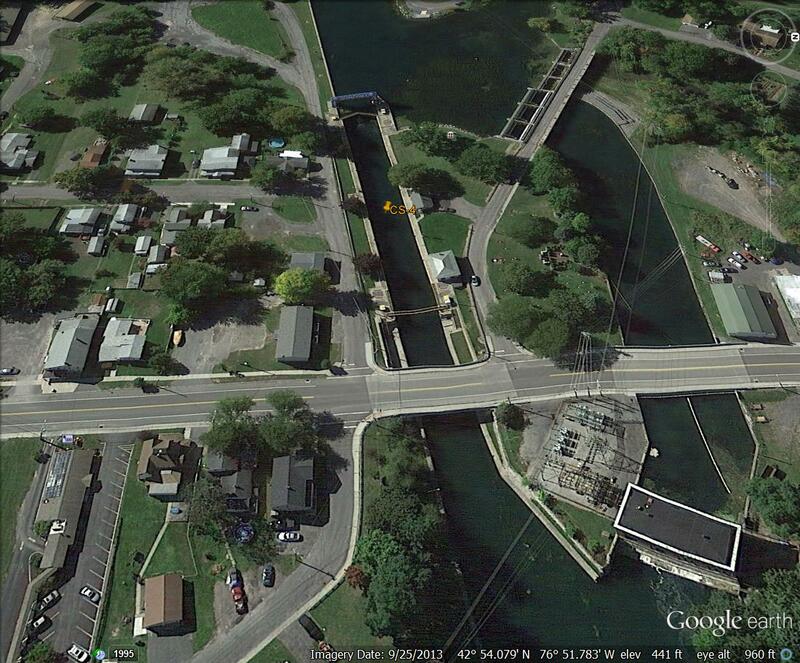 The Cayuga-Seneca Canal from the C-S/Erie Canal Junction to the Cayuga Lake/Seneca Lake Junction is 4.2 SM (3.6 NM). Cayuga Lake is 5.8 SM (5.0 NM) while Seneca Lake is 17.3 SM (15.0 NM). To further break this down, from the first lock CS1 to the last lock CS4 is a total of 8.5 SM (7.4 NM). Continuing south it is an additional 1.9 SM (1.7 NM) to the entrance to Cayuga Lake, then an additional 36.1 SM (31.4 NM) down the lake to Ithaca, NY. A total of 43.4 SM (37.7 NM) from the Cayuga-Seneca/Erie Canal Junction to Ithaca. Turning westbound for Seneca Lake it 13.2 SM (11.5 NM) to the lake’s entrance via Seneca Falls and Waterloo, NY. On entering Seneca Lake, it is an additional 37.7 SM (32.8 NM) down the center of the lake to Watkins Glen, NY. A total of 52.1 SM (45.3 NM) from C-S/Erie Canal Junction to Watkins Glen. Complete distance tables can be found at the Cayuga-Seneca Canal Distances Page. The tables are published in Statute Miles, Nautical Miles, and Kilometers. They are available for download. Red markers are kept to starboard south and west bound from the Erie Canal Junction to both Cayuga Lake and Seneca Lake. All Lock chambers are the same; 328 feet long and 45 feet wide and offer lines hanging on the lock wall for your vessel. 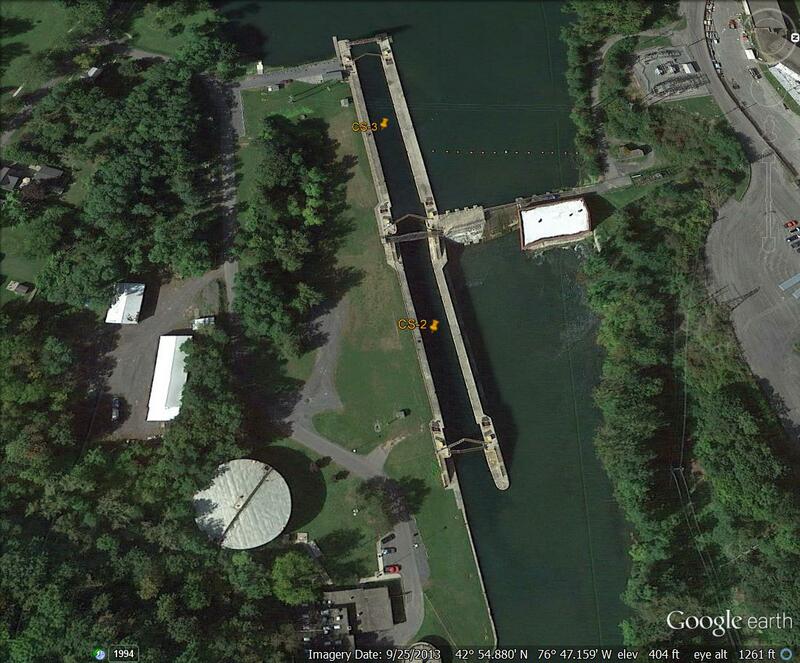 A complete listing of the (4) Cayuga-Seneca Canal Locks with distances, lifts, and estimated transit times can be viewed at the Cayuga-Seneca Canal Locks Page. These tables are available for download. Project channel depths for the Cayuga-Seneca Canal are 12 feet in the channel and 12 feet over the lock sills. At normal pool level, minimum overhead clearance is 16’ 0" at bridge S-3 (1.6 SM west of lock CS1). At maximum pool level, minimum overhead clearance is 15’ 3.6" at Guard Gate #4 at lock CS4. For a complete listing of Cayuga-Seneca Canal bridges, guard gates, and utility crossings along with their clearances, visit the Cayuga-Seneca-Canal Bridge Clearances Page. These tables are available for download. All lockmasters maintain a watch on VHF channel 13 (156.650 MHz). Phone numbers of each lock can be found at the Cayuga-Seneca Canal Locks Page. From the Erie Canal/Cayuga-Seneca Canal Junction to Lock CS-1 - 30 mph (26 knots). 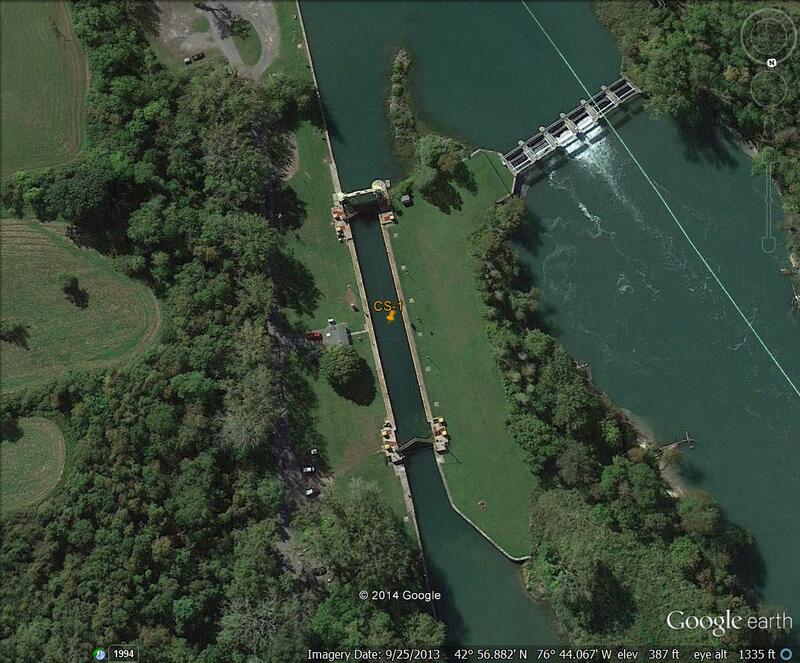 Lock #CS-1 to the entrance to Cayuga Lake - 10 mph (8.7 knots). Ithaca Navigation Channel - 5 mph (4.3 knots). Lock #CS-1 to the entrance to Seneca Lake - 10 mph (8.7 knots). Seneca Lake - No Speed Limit. Watkins Glen to Montour Falls Navigation Channel - 5 mph (4.3 knots). Speeds broken down by each canal segment and provided in MPH, Knots, and KPH can be found on the Cayuga-Seneca Canal Distances Page. As a general guide, the Erie Canal Junction at Kipp Island to Seneca Lake will require about 2.8 hours @ the posted speed limits. A vessel making 10 knots will require 3.0 hours for the same transit. 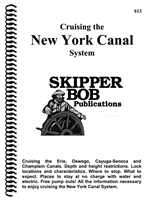 Distances between major points along the Cayuga-Seneca Canal can be found on our Cayuga-Seneca Canal - Distances Page. The distances table shown is useful in planning your transit through the canal. NOAA Weather broadcasts can be found at 162.500 MHz (WX-6 VHF) out of Ithaca, NY (WXN59). This station provides coverage for both Lake Cayuga and Lake Seneca for current and forecasted weather and emergency alerts.